This is the second of two posts discussing Murphy's Law and how it impacts components of online learning, especially with the increase in technology being utilized in the online learning environment. This first post addressed these Murphy's Law issues and provided steps for how to plan for broken links, misbehaving applications, etc. both before and after they happen. This second post addresses giant lockouts, learning curves, updates to the Learning Management System and how you can apply R.E.A.D.Y. to some of these less familiar scenarios. 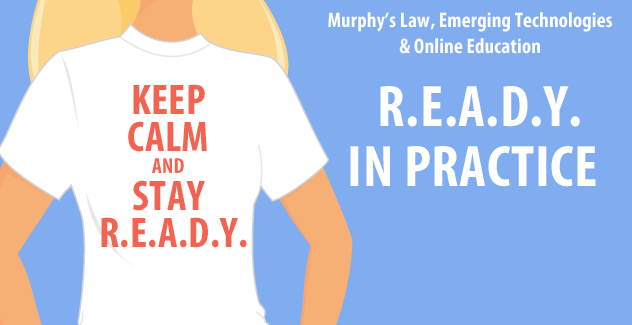 In any year of online instruction, there are ample opportunities to apply R.E.A.D.Y. Of course, the Internet Archive’s Wayback Machine can be put to use practically every semester: sometimes because websites have disappeared, other times, because they are temporarily down. Broken links are something faculty can prepare for; they are a problem that we understand. There have also been problems that were less familiar. Giant LockOuts: We have experienced several variations on the lockout theme. Those variations include a natural disaster that caused a week of city-wide power outages, a LMS failure that stretched on for days, and a faculty and student weekend lockout from courses. First and foremost, faculty used rapid responsiveness and damage control to contact students using alternative paths. In some cases, these alternative paths continued to provide a means for submitting assignments and completing coursework via email. Faculty collaborated to plan for worst-case scenarios, and build consensus on the best ways to help students succeed amidst the challenges. Learning Curves: Distance testing proctor applications are becoming increasingly important for online programs to meet the standards of quality education. Students and instructors may find themselves piloting the software together. Indeed, any piloting process requires an ample dosage of grace and yielding as instructors learn to anticipate different problems students may encounter. Learning Management System (LMS) Updates: Improvements in technology can be a mixed blessing. While updated to learning management systems may improve overall functionality, they come at a cost: faculty must learn how to use new features, and sometimes those updates create new glitches. Such was the case for a recent update in our LMS. Our institution places a premium on professional formatting and style in written compositions. Students are expected to conform to meticulous standards in terms of setting margins, running heads, and justifications. They master this process early with education and orientation. An update to the LMS spontaneously altered the formatting of submitted student papers. This could have negatively affected students' grades. As you might expect, once the system glitch was detected, all the students papers were re-graded in a flurry of paperwork to ensure each one was assessed correctly. Yielding is not always easy, but it is the right thing to do. Some technology glitches are more amusing than tragic. Meeting applications allow instructors to hold live meetings and office hours. A recent experience with embedding a live-meeting application within an online classroom enabled and empowered more than instructors to launch meetings. Students were somehow empowered to spontaneously launch meetings as well. This glitch was certainly not desirable for the instructional team, nor was it resolvable within the software. While this feature did not pose a significant threat, it did make for some trepidation in the instructional team. But a good sense of humor and a willingness to learn from mistakes are keys to success in any arena. Neuroscience says we learn better from our mistakes than from our successes. To be sure, online classrooms give us ample opportunities to learn in the best ways possible. Miriam Abbott (right) and Peggy Shaw (left) have a combined two decades of experience in online education. They’ve used multiple Learning Management Systems and had plenty of opportunities to learn from mistakes. Peggy is a nurse educator, with a profound commitment to helping new students acclimate to online learning environments. Miriam teaches online and hybrid courses in ethics and composition. Happily, neither have experienced a Murphy’s Moment with SoftChalk, it’s been a terrific tool for engaging students in their online classrooms. 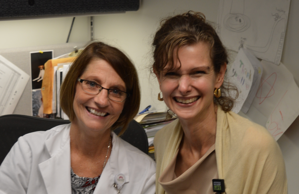 Both educators hail from Mount Carmel College of Nursing in Columbus, Ohio.